Secure script-driven Windows FTP client with 100+ commands supporting normal FTP and 128-bit SSL and SSH secure servers. Features iintegrated PGP encryption/decryption. Also features integrated e-mail, ZIP archive support, COM/OLE, single command file synchronization. 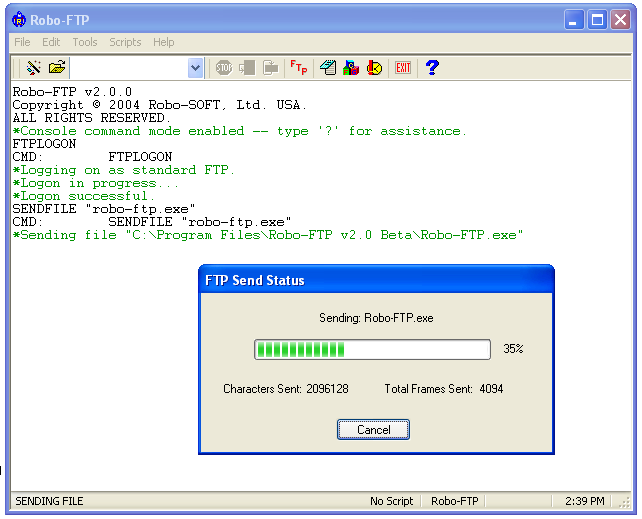 Utility provided to install Robo-FTP as a service on NT class PCs. Script file wizard provided to build basic scripts by following simple "file in the blank" style prompting. A Breakout games are among the most celebrated in the world. Qweas is providing links to Robo-FTP 3.7.8 as a courtesy, and makes no representations regarding Robo-FTP or any other applications or any information related thereto. Any questions, complaints or claims regarding this application Robo-FTP 3.7.8 must be directed to the appropriate software vendor. You may click the publisher link of Robo-FTP on the top of this page to get more details about the vendor.